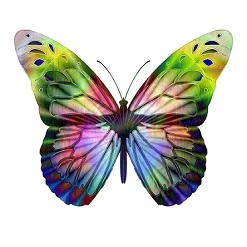 Here is a list of the Symbolic Meaning for Each Different Colored Butterfly, including myths, legends, superstitions and folklore related to each butterfly's color. One day, when you're least expecting it, you might catch a glimpse of a butterfly near you; maybe it's wildly fluttering over your head or even lands on you, as if trying to get your attention; This 'chance' encounter with the butterfly is said to have spiritual meaning. Ever have a butterfly, or even a moth make it's way inside your home or see it on a wall? There are mythical meanings to that too. Some butterflies are predominantly one color, but many of them have multiple colors. If you're not sure what color to identify the butterfly as, just choose the butterfly's most dominant color, or look up the meaning for each of its most prominent colors, e.g., if you spot a yellowish-brown colored butterfly with large black spots, you might what to see the meaning behind all 3 colors: yellow, brown and black. Symbolism and Mythology associated with Red Butterflies; prominant red markings; or, brownish-red butterflies. Symbolism and Mythology associated with Orange Butterflies; prominant orange markings; or, brownish-orange butterflies. Symbolism and Mythology associated with Yellow Butterflies; prominant yellow markings; or, golden butterflies.